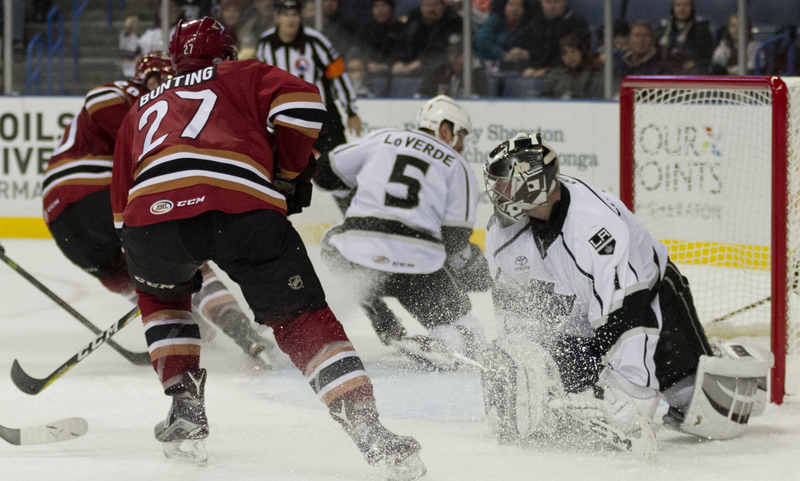 The Roadrunners fell victim to a grooving goaltender in their 4-1 loss to the Ontario Reign Friday night at Citizens Business Bank Arena; the club has now lost games in consecutive fashion for the first time all season. Coming off of what Head Coach Mark Lamb referred to as “the team’s worst performance of the season” Wednesday night in San Diego, and adapting on the fly to a slew of lineup changes, the Roadrunners played a solid, structured game in Ontario – one that presented numerous scoring opportunities carried out in good flow. “We played hard, we did a lot of good things, I thought [Jack Campbell] played really well, and he was really the difference in the game,” Lamb said. Campbell, who made 24 saves during the evening, shunned the Roadrunners on a handful of Grade-A scoring stabs throughout the night, at one point leaving Chris Mueller to look helplessly up to the heavens as the Reign’s netminder staunchly nixed chance after chance. Friday night was the first time Tucson saw Jack Campbell in net; Anders Lindback, who was released by the Reign two weeks ago, started both games the teams played in early November at Tucson Arena. Ontario’s Brett Sutter opened the scoring four minutes into the game, shoveling what looked to be a secured puck out from under Marek Langhamer’s pads and into the net. Eric Selleck answered three minutes later, tying the game with his third goal of the season, scoring the Roadrunners’ only goal of the night when he one-timed a Mark Olver feed from the right hash-mark high to Campbell’s far side. The Reign took a 2-1 lead with just over six minutes to play in the second, added a third goal two minutes into the third, and topped off the night with an empty-netter with 1:26 left in regulation. The game didn’t end with a little bit of hostility, however, as a combined 44 penalty minutes were assessed during the final 28 seconds of play following an Eric Selleck hit. Selleck was given a two-minute minor charging infraction for his hit that sparked the late-game melee. Due to personnel changes stemming from roster moves and injuries, the Roadrunners played line combinations they weren’t necessarily accustomed to. Lamb, however, was pleased with the roster’s quick adaptation to the units drawn out. 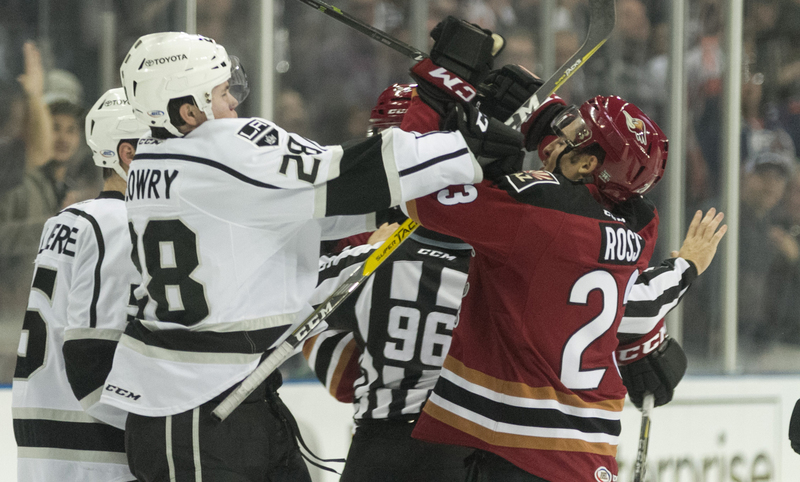 The Roadrunners will complete their three-game California road trip Saturday night when they take on the Bakersfield Condors at Rabobank Arena, where the puck is scheduled to drop just after 7:00 PM MST.